After classes in the morning we always have lunch together at the Bible College. Wednesday is Ramen bowl day. Hurray! Variety is the spice of life. Everybody digs them, they taste so good. Eat up guys, because on Wednesday nights are Curry and Rice dinners. Everything is so yummy. While over looking Kakazu Ridge, you can see everything around you. In the bottom center picture is where Trevor lives, the middle picture is the CCBC Building. Both Tevor and the Bible College are located in Ginowan City. Our city has over 87,000 people living in it. In the upper left picture we have the guys looking into one of the caves on Kakazu Ridge. The picture on the right are the team looking into a WWII Pill box (Japanese concrete war structure). We will be visting a lot of cool sites again this semester. Sunday night was a real blessing. The students are here, ready for Bible College, and a few of them did some special music for us. God continues to bring new people to the Koinonia Cafe. It is such a blessing to see so many Japanese people hearing the Word of God and growing in the Grace of the Lord Jesus Christ. Please continue to pray for us, as we share God's wonderful Love. Sunday after church we went down to Sunabe and saw the surf competition. The waves were "blown out" (not much shape to the wave) but everyone was having a good time. The wind was extremely cold, but the water was a comfortable temperature. Oh the days of surfing, there will be another day. Gershon arrived today, and that afternoon we took him to one of our favorite restaurants; the Dragon! It was a fun afternoon. Let me tell you a little about Gershon; he is originally from Germany. He is in his second semester with CCBC. His first semester was in Siegen, Germany. He is an only son, with four sisters (yikes!) He plays the guitar, likes to exercise (mostly running), and is in love with Jesus Christ. It is great to have you here with us Gershon, may the Lord continue to lead and guide you bro. All three guys arrived safely to Okinawa on ANA (All Nippon Airways). Michael is originally from Richmond Virginia, he attends Pastor Jay Wright's church at CCRichmond. Daniel comes from CCLivingwater, and Matt comes straight from Murrieta Bible College in California. It is a blessing to have these guys with us. They arrived in good spirits. I thought that they would be a tired, but they were good to go. Please continue to pray for these guys, I know that God has good things in store for them here in Okinawa. Cacie just arrived yesterday, and it is a blessing to have her with us. She is a recent graduate of CCBC Murrieta and she will be teaching our Lifestyle Evangelism class this semester. Cacie has done a lot of outreach ministry and will be teaching the students new ways to share the Love of Jesus Christ. Please continue to pray for our interns, they have a lot of ministry on their table. Time to dig in. 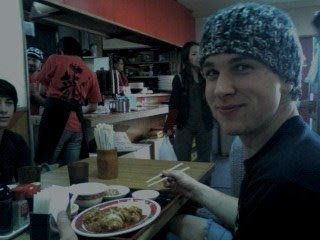 Mark Starr it back in Okinawa! When Mark first left Okinawa he hopped on a plane straight to Hawaii. Yes, basking in the sun on Waikiki beach, but then came some trouble. I will let him tell you that story. But after that he headed to New Mexico where he was able to hook up with some of his friends. Mark said that he is glad to be back on island. He missed Okinawa very much. Well, we are so glad to have him back with us again. May the Lord continue to use Mark as he studies the Word of God and serves again here in Okinawa. That is right folks, we got him, the famous Trevor Raichura. For some of you who don't know Trevor he is our world famous Canadian brother who is fluent in Japanese. Trevor originally came to Okinawa via Ie Island. He was hired as an English teacher on a remote island off of Okinawa. While being on Ie jima (Ie island), Trevor was immersed in the Japanese culture and picked up the language quickly. We are so blessed to have this brother teaching Japanese I for us this semester. Trevor is also one of our Bible study teachers who teaches at w2 (Worship/Word) on Sunday nights. You students are in for a good treat, learning from one of the best. Remember I said one of the best, because you still have to put Natsuki, Tim, Kayo and Yoshi in on that mix. Kayo blessed us today by taking us out to her families restaurant, Bambohe (Bam-bosh). It is a Yakiniku restaurant. You might be wondering "what is Yakiniku". Well it is a Japanese Bar-B-Que. You go and get your meat, and cook it at your table. The best thing about it, it's "all you can eat". We wanted to take Amber out and show her the town, so after lunch we walked around the famous; Kokusai Dori (coke-sai street). The students arrive tomorrow, so we thought we would show her around before it really gets crazy around here. All in all, it was a fun afternoon. This Sunday night was a special night for us at w2; Not only did we have a larger worship team but the worship time was sweet! The Lord really touched all of our hearts this evening. It was so good to see all the new faces. The thrift store is really coming together. We spend some of Saturday afternoon sorting through the items that have already been donated to us. We hope to open in a few weeks. Please continue to pray for us that we would be able to outreach to the Okinawan Japanese people in our area of Ginowan City. Hideyuki is a good brother here in Okinawa. He loves Jesus and surfing. Here he is playing Kelly Slater surfing on xbox 360 for the first time, and he was blown away. Please continue to pray for our brother, we know that God wants to use him in a wonderful way. Let the Birthday Cakes begin! Even though it was Pastor Tim's birthday on Monday, we had a cake for him on Wednesday night after service. We have been looking over the Bible College schedule and there are going to be a lot of birthdays while there are here. You know what that means, cake for us all. We like cake here in Okinawa, because we usually don't get it. So whatever the occasion, we try to eat it whenever we can. Our neighbor Kenjisan went fishing the other day and brought home a reef crab and lots of clams. He brought over a bag full for us to eat, so we did. For lunch we made clam pasta and it was excellent, "cho oshi kata" (tasted so good). Kenjisan is a good man who always hooks us up.